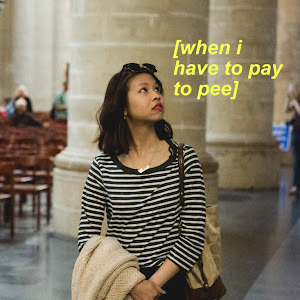 But it also gives me time to share a topic that I've been meaning to write for quite some time, ever since I penned my Winter Skincare post and landing back in London with pretty irritated and post-holiday breakout skin. I shared my 'transformation' (if you can even call it that) on Instagram and about three people messaged me to asked me what kind of products I've been using. As a veteran in acne and combination skin, I've gone through an endless search for the One True Product that will save my skin, after a year stint of Roaccutane (my lips are now perennially dry) and stripping back to the basics – I've come to terms of how my skin behaves, particularly during hormonal changes and when I experience stress. 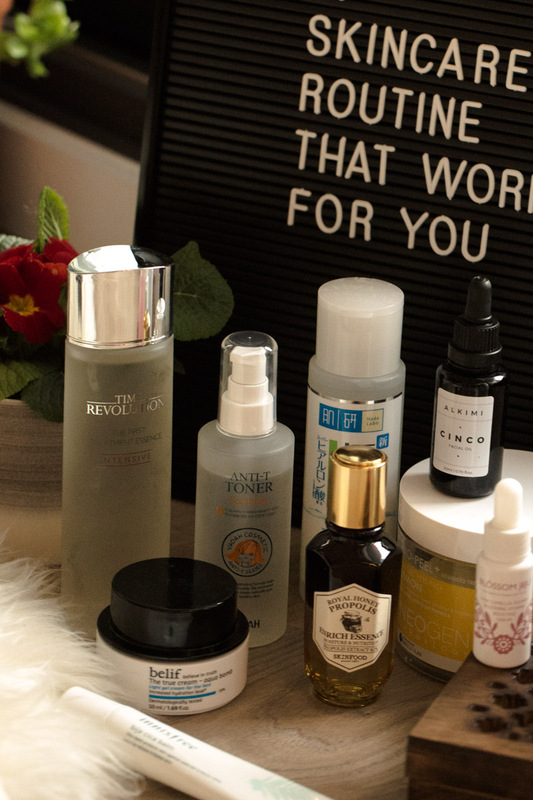 After years of reading trendy articles on Refinery29 and other blog posts claiming products that seemed to change someone else's lives except my own, so I sat down and decided to think about creating a skincare routine that works for me. You'll see that Week 0 I started with very sore bumps, inflamed skin and the like. Not what I would call amazing. So I tried to incorporate a routine over the next three weeks to calm down the redness, and the final photo was taken last Friday where my scars are still obvious but much better compared to when I started in February. There is no miracle for achieving flawless skin. I think I've learnt that the hard way. Even though it's hard to accept because your skin is screaming and your self-worth is plummeting, there's no magic in the world if you're not willing to work and understand your own body. I swear by making my twice daily skincare routine as a ritual, in which I completely focus on nourishing my skin with the intention of healing it. Setting aside time in the mornings and evenings to create a space undistracted by time, or idle thoughts can be a form of self-care, quiet contemplation and enjoyment. If you're the sort of person that gives less thought into skincare because you're okay with it or that you're blessed with amazing skin, so be it. But no matter the definition you have created, stick with that mindset. I found that concentrating on what I put on my face everyday is something I continue to look forward to, and understanding how my skin reacts to emotions (I'm horrible at dealing with anxiety and stress), external aggressors (pollutions) and temperature. 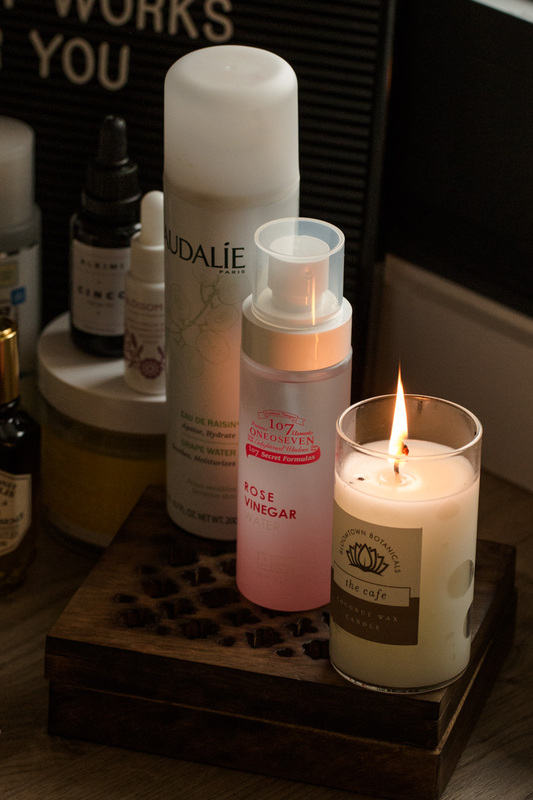 Being conscious and dedicating time to skincare meant I knew I was in control of what was going into my skin, and mindful of the ingredients that work (or not) for me personally. Incoming cheesy quote - like most things in life, you can't have it all. 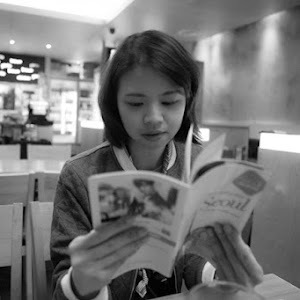 For so long, I was overwhelmed with the claims for each product I owned and hoping for a perfect solution. Now I start with one thing I want to work on, before moving on to the next. For me, my main concerns are dehydration, acne and scarring. My immediate concern is dehydrated skin as that's usually what affects my skin, leading to a compromised skin barrier, and more acne-prone skin. You see the loop? 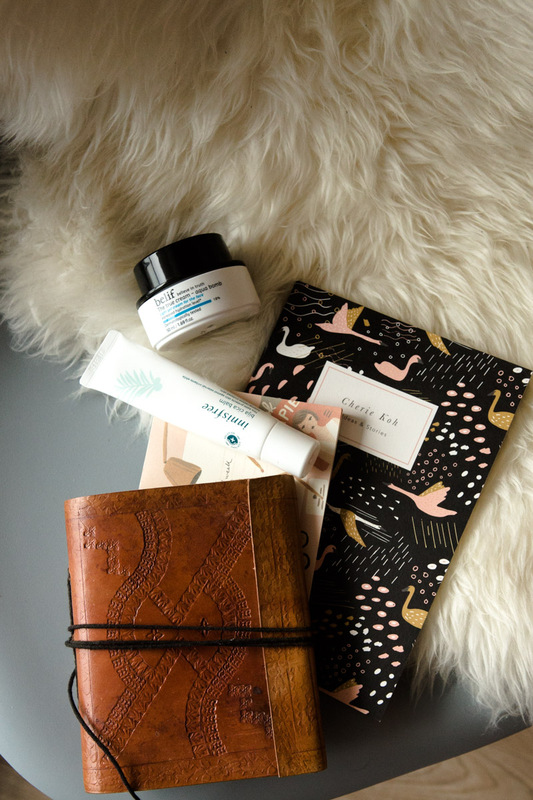 Once I decided that hydration was something I wanted to tackle, I based my routine around products that my skin likes and know will work well to more targeted concerns like soothing, firming or brightening. 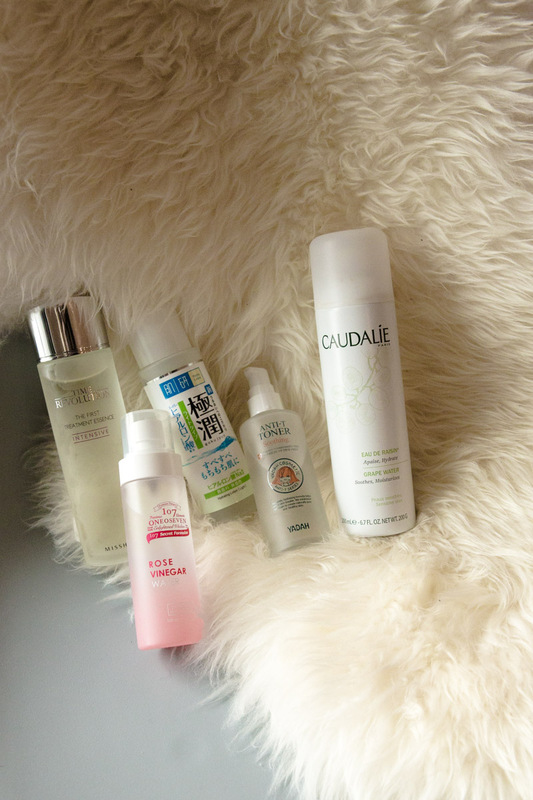 For frequent spritzing, my favourites right now are the Caudalie Grape Water and the 107 Rose Vinegar Water Toner. The Caudalie comes in a giant cannister, handy for days at the home desk, it's 100% grape water and fragrance free as well. 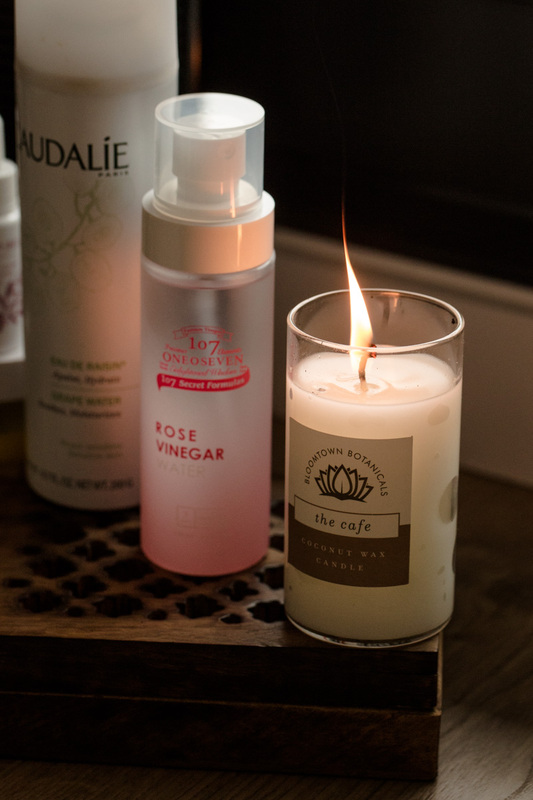 The 107 toner has rose water and vinegar, both to moisturise acts as a anti-bacterial ingredient. Some of my thicker toners include the Missha FTE Intensive and Hada Labo Gokujyun Hyaluronic Lotion which I use in the first step of my skincare routine. It achieves what I want, which is to hydrate and no more. 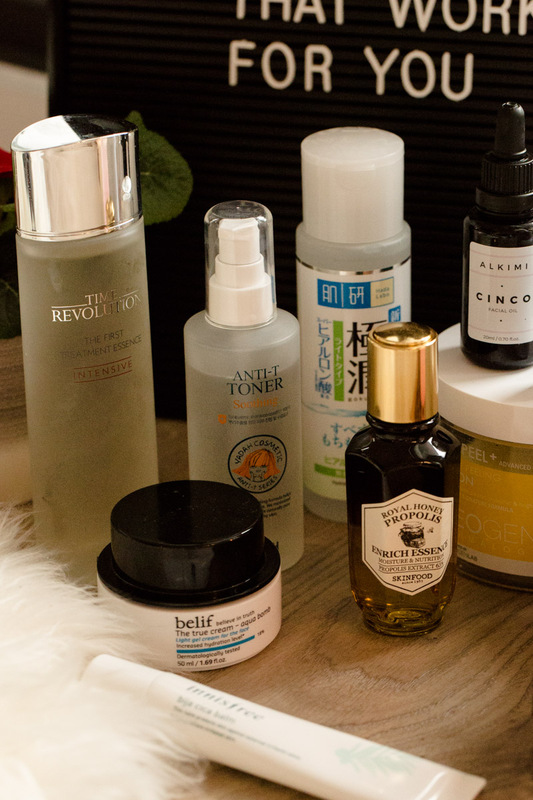 I don't want to irritate my skin at the beginning of the routine, so something simple and effective works best for me. The Yadah Anti-T Toner is a newbie to my routine but is already well-loved during my hormonal acne period; it boasts a 7-free system with Black Raspberry extract mainly as an inflammatory ingredient. Five may seem a large number, but knowing when and where to fit these products around my routine helped me improved my skin slowly. 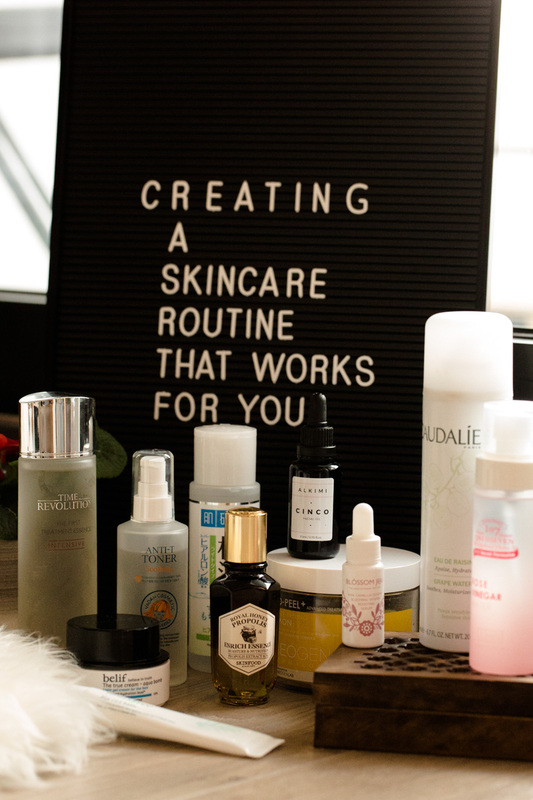 It's easy to get distracted by new products and flashy ingredient lists which may or may not work with your skin (we've all been there) but being consistency is key and being strict with your routine once you've got it set out. 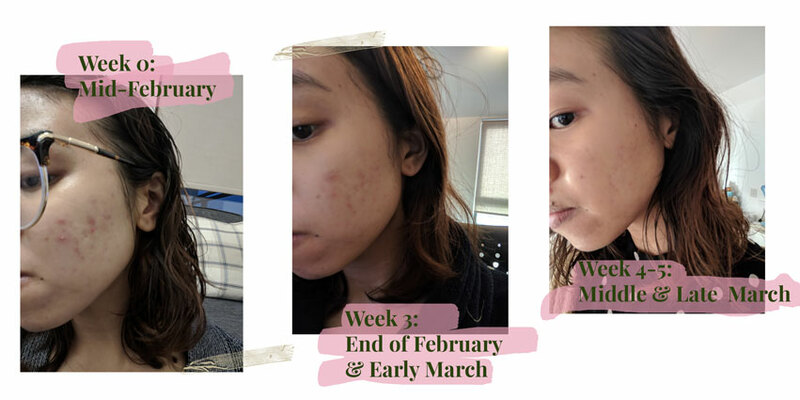 Products only started to show results after 4-6 weeks (in my experience), as a full skin cycle takes about 6 weeks anyway. Which is why I always get slightly skeptical when a brand / influencer claims immediate results after one week or so. My experience took me about 5 weeks to see any sort of results and I'm living proof that products do work, they just take time. It's disheartening to wake up to see that giant cyst still there (trust me, I know) but it will get better. 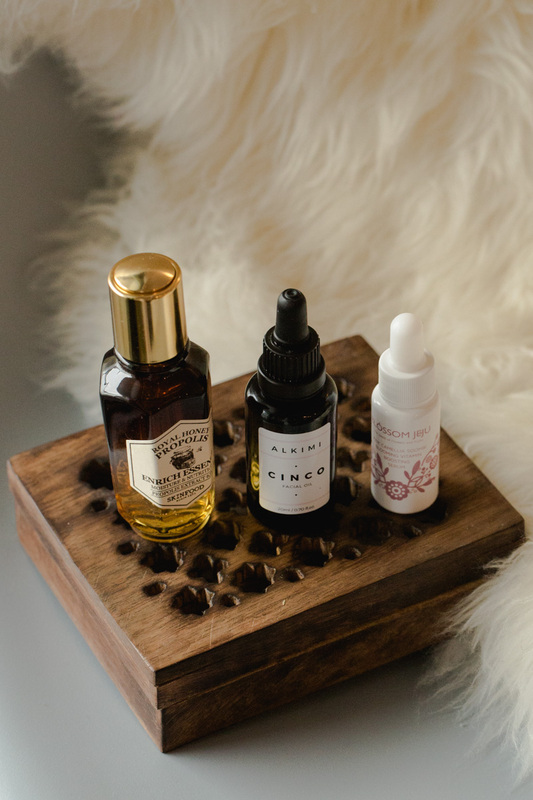 To supercharge my hydration, I look out for skin nourishing ingredients: bee propolis (also anti-inflammatory), ceramides, omega 3 and 6s and anything that will help boost my skin moisture. Three products that I trust in my routine are the Skin Food Royal Honey Propolis Enrich serum, my beloved Alkimi Cinco oil and when needed, the ever-great Blossom Jeju Pink Camellia booster serum (mini version). I've since run out of my Cinco oil and switched to a different oil for now, but the remainder of my routine remains the same. It's embarrassing to say, but it feels liberating to be in control of what goes into my system everyday, knowing that I've looked into the products I'm using and being okay with new products that don't because it's all part of the process. Although it took me a long time to find and note the ingredients that work for me personally, it might be easier for you. 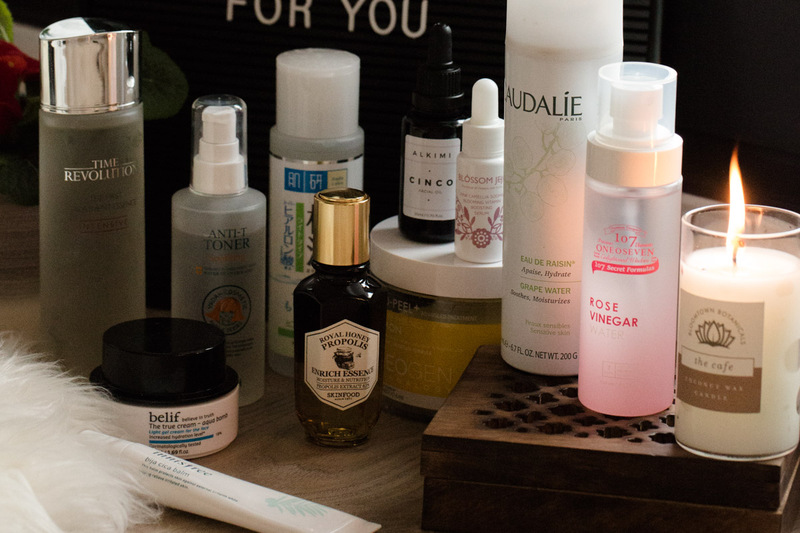 The skincare industry has come a long way, and there's a lot of resource out there to read up on and learn which might be the right ingredients for you. I was very frustrated because nothing seemed to work for me for so long - hyaluronic acid which everyone adore just didn't give me the results I wanted, it didn't make my skin worst but it didn't improve it either. The same with Niacinamide and Alpha Arbutin, both of which was to soothe and brighten acne scarring. I was at my wits' ends... until I found Centella Asiatica. 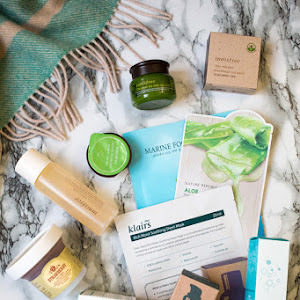 I began to notice a difference when I used sheet masks with centella as its main ingredient and my skin always looked less red and even healed faster in some cases. It's anti-oxidant properties are meant to calm irritated skin, which is frequent in my case. 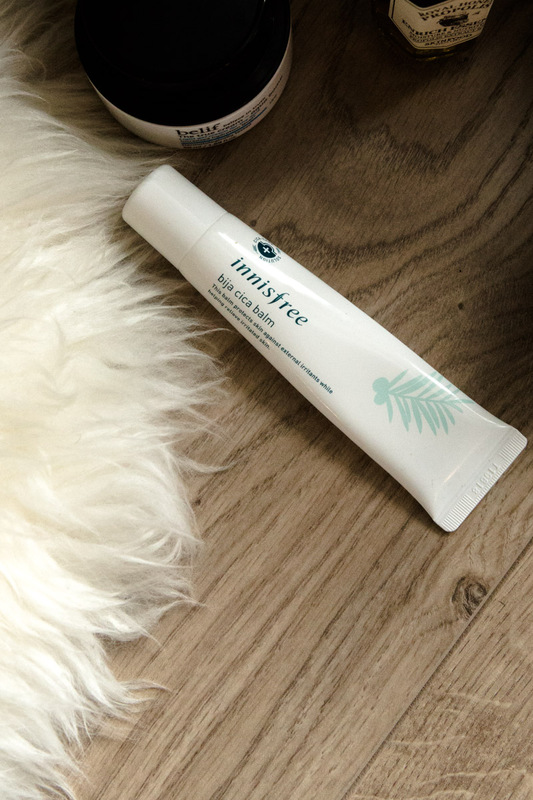 So I decided to try out Innisfree's Bija Cica balm, packed with other bioative compounds of centella: madecassoside and asiatic acid, meant for sensitive skin. And wow I was amazed at how my skin reacted so positively to it, it didn't flare up more, and I was able to keep working on hydrating my skin to prevent acne breakouts. I also know that essential oils don't react greatly to my skin so finding a good moisturiser which ticked those boxes took me a while. But I've found a new love, in the form of the cult favourite Belif True Cream Aqua Bomb. Although it has 'cream' in its name, it's actually a gel-like formula and glides onto my post-serum and oil skin amazingly. It's a bit of an understatement to say I'm addicted to this. I started this in mid-February and am already two-thirds into it! If anything, the biggest lesson to making your routine work is patience. I won't lie, being persistent while your skin hurts like hell isn't easy but there will be light at the end of the tunnel. I actually surprised myself to see that my skin had actually improved, because you tend to be your own critic, especially when you look at your skin every damn day. I can't say to have completely healed my skin 100%, but I'm happy I have found a routine that works for me and am always looking for ways to keep improving. 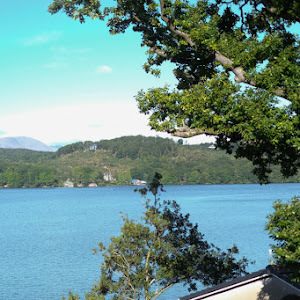 I'm trying to include more de-stressing activities in my life which I know contributes to my skin health - making sure I drink enough water, sleep, taking time out to be present. 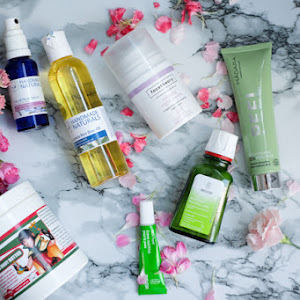 I hope this has been somewhat helpful - I certainly was lost when I started on my skincare journey, so it's comforting to know that someone out there might feel the same way.